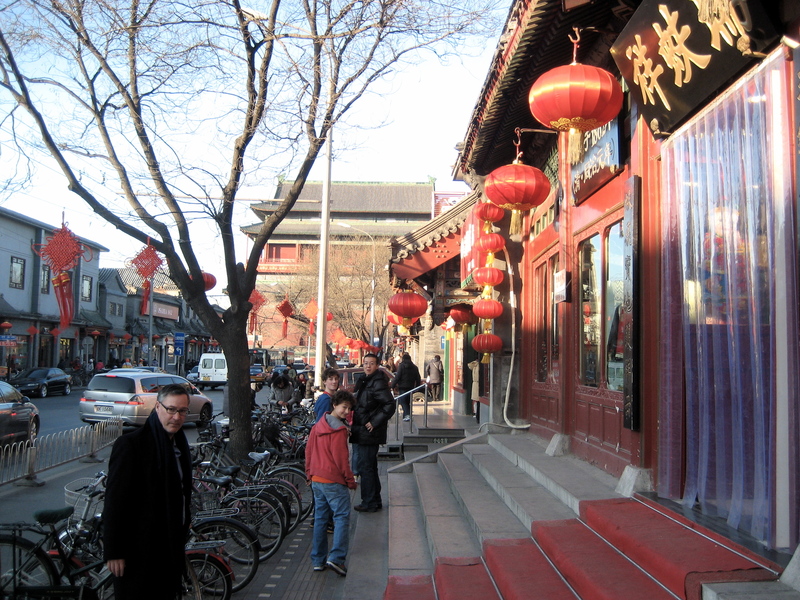 It is a little surreal to think we haven’t even been living in Beijing two weeks yet. Perhaps it is because we are already into a routine. And unlike traveling, we have all the regular daily things to do. Like buying food. Furnishing a house. And paying bills. Each an adventure! Bills have been the most challenging so far. Last Tuesday, John very kindly offered to draw me bath. When he called down to say he could not find the hot water, I, much less kindly, thought what an idiot! The hot water tap has a big red ring around it. Turns out, there was no hot water. Or heat. We had neglected to top up our gas! In Beijing, or at least where we live, you do not get a gas bill but rather a gas card, which you must prepay. Like a phone card. And you can only make a substantial payment (one that lasts more than 48 hours) on Mondays and Thursdays between 9 and 12. Electricity, phone, water and propane for the stove all work the same way. Driving around Beijing is a particularly hazardous undertaking and we have hired a driver for at least the first month. Actually, can’t imagine ever driving here. Traffic is insane… at all hours of the day or night. At one major intersection I was naive enough to assume the green arrow flashing toward the left was a turn signal. No one else mistook it for this. Three lanes in each direction were all going at once, some turning, some speeding straight ahead. What should have been the largest gridlock ever, some how worked. However, it doesn’t always work. Yesterday I saw a dog get hit several times (absolutely horrible, I am still shaking) and two cars totaled. Rumour has it drivers are upset when passengers put on seatbelts. Shows a lack of confidence in their abilities. I am upsetting them all the time… and badgering the boys to upset them too. We enjoyed or first Beijing Duck over the weekend at Da Dong, which was voted best duck in the city by Beijinger Magazine. Not sure that counts for much, as I hear it is just one guy’s opinion. That said, it was fantastic!!! They thinly slice the skin and meat together and give you 8 different condiments to have with it. All one course, skipping the lettuce wrap part we are used to. Our favorite combination was dipping the duck in coarsely ground sugar. Unfortunately we cannot go back. Jack refuses to eat in a restaurant that also serves sea horses, turtles and shark fin soup. While I can’t argue with his moral position, I do fear that ultimately Mc Donald’s will be the only option left. John is off to Shanghai tonight, his first business trip. The boys are adjusting, Jack a bit less happily that I would hope. Hunter is embracing everything, including the shopping. He bought an ”I Heart (love) BJ” shirt. “Get it” mom? Big shock when I did! I am using Chinese every chance I get and improving, slowly! Net net, all good here!